Good Morning ! We are having a nasty weather day here in the Chicago area.. snow, freezing rain, and rain! 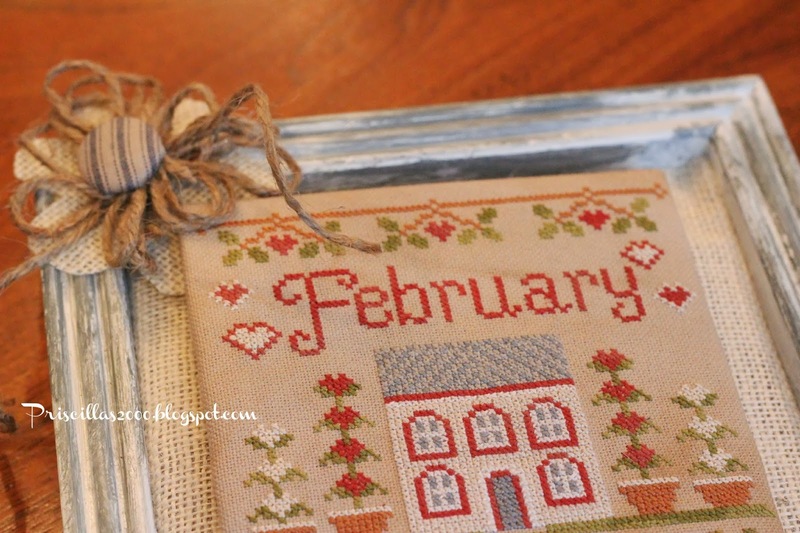 Last night I finished this Country Cottage Needleworks February Cottage. I changed all the colors, it was supposed to be alot of pink .. I wanted to display these two together so... this is what I came up with.. I bought this little square frame at the Goodwill for $1.99 ..It is actually a mirror. I painted it off white and then dry brushed with gray paint. I wanted it to look old and worn.. I used some of that laminated burlap in the cream color and glued it to cardboard to put in the center of the frame. I made a twine flower and glued it onto a burlap flower shape that I cut out of the laminated burlap.I also made a covered button from ticking for the center of the flower. Don't they look great together ? I would love for you to follow me on Instagram, Facebook and Pinterest ..all the links are in the sidebar ! Have a great day !Thanks so much for stopping by ! I love your visits and nice comments ! 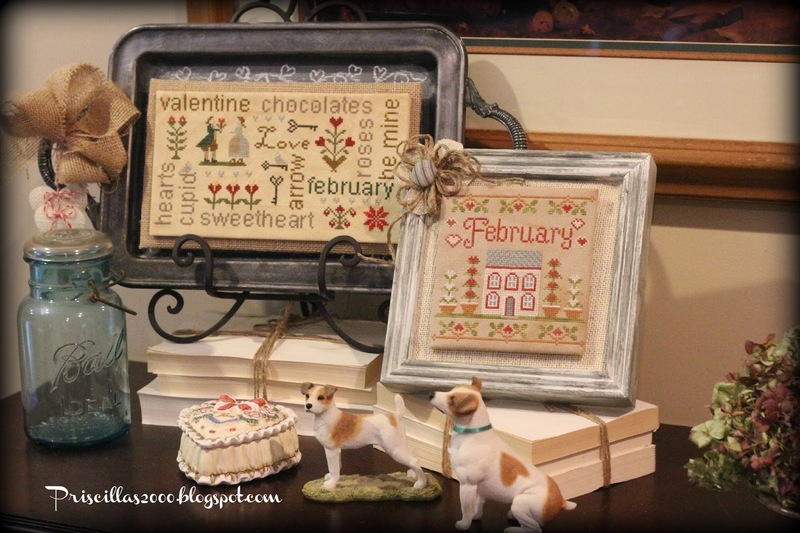 What a fabulous idea to stitch each month for a great vignette...Just love it...and following you on Instagram too! Priscilla, you are so clever! I just love how you changed the thread colors to suit you - perfect. Thank you so much for sharing your amazing creativity and talent with us!! 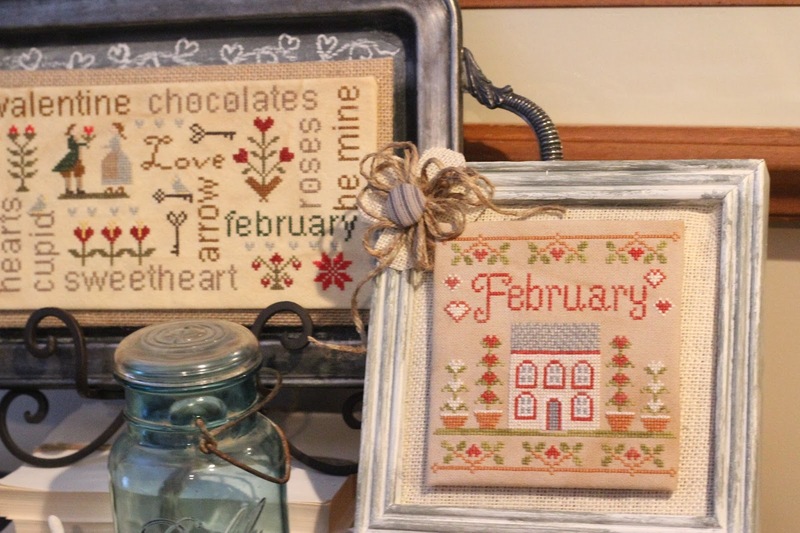 I love the way you are displaying the cross stitch. What a clever idea to use the magnet. I like your color choices better. I do the same thing. I find that I rarely use pinks or purples. They just don't go with the colors in my home. Great idea for the frame! That is fabulous! I love it :) LOTS! I love your finish, what a great idea to use a magnet and change the months, just brilliant. The little twiney, burlap flower is pretty too, you have such clever ideas. You really have had some terrible weather haven't you!!! Hope it all calms down soon. I love the country cottage style!! And this needdleworks is fantastic and pretty! Beautiful stitching! I love the idea of having a monthly piece to display. 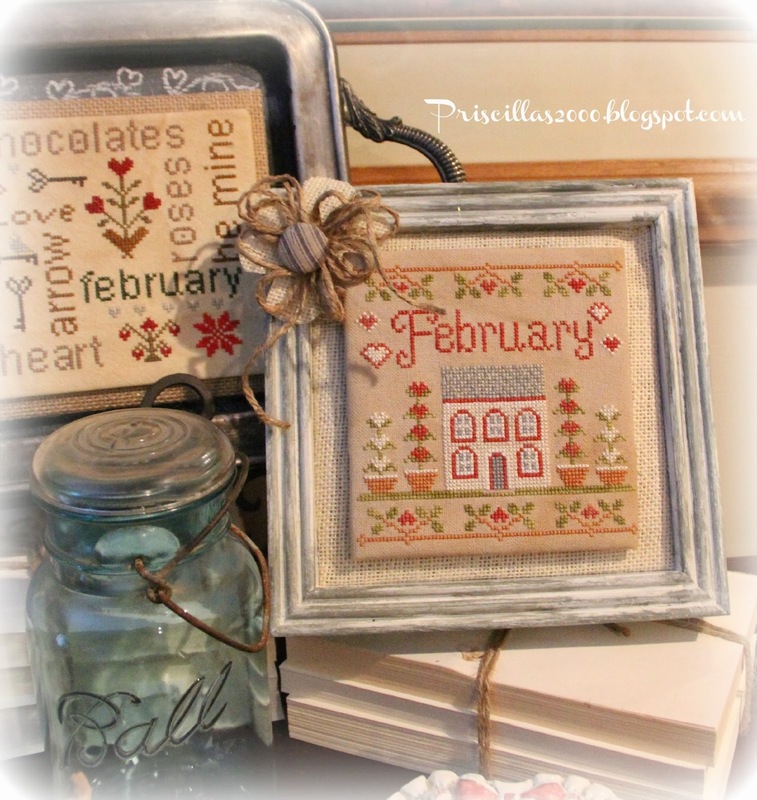 Lovely color changes for the cottage, Priscilla--the two look so cute displayed together! I hear we're in for more cold temps next week--at least we have a sunny day today and it's 46°!! What a difference the sun makes! You are so talented and creative! 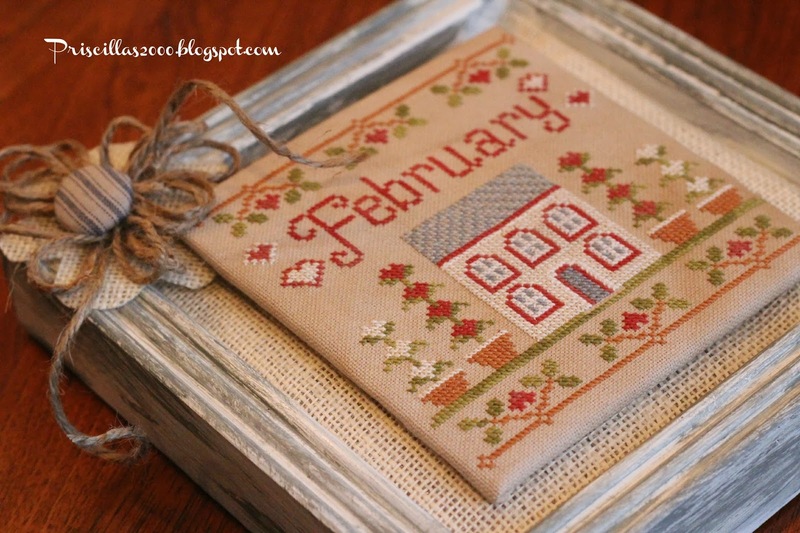 They look great and I love the idea to do a different one for each month. These are beautiful. Makes a lovely vignette. Beautiful stitching. i like the vignette you created with these two pieces. 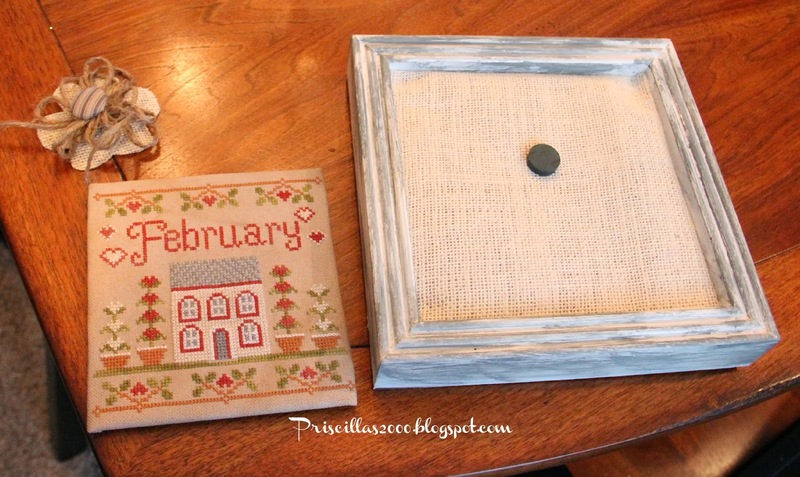 Do you glue the magnet to the burlap and a washer to the back of the piece? What type of glue do you use? Thx! More Scarves, Stitching ,Spring and Hobby Lobby ! Granny Square Blanket Finished ! It's October In February ! My Favorite Infinity Scarf Pattern Dressed Up !